Pain from an Auto Accident? We Can Help! Auto accident injuries can lead to debilitating health conditions such as chronic back and neck pain. You may receive injuries that require immediate medical attention, but you may also just feel stiff and sore sometime following the accident. Either way, Dr. Kevin Goyke can help you find the road to full recovery! Common auto accident injuries that do not receive immediate medical attention are back and neck injuries such as whiplash. When your body is unexpectedly jarred in an auto accident, injury can result because of the sudden movement past your spine’s normal range of motion. You may not notice the back or neck pain right away. Strains and sprains are also common auto accident injuries. The sooner you seek treatment, the better. Whiplash and other spinal injuries can lead to chronic conditions later on due to the body’s natural inflammatory response to injury. Inflammation is meant to protect the injured tissue, but it also inhibits the healing process by restricting blood and fluid flow in the injured area leading to pain and swelling, decreased range of motion, joint fixation, fibrosis, adhesions and arthritis. 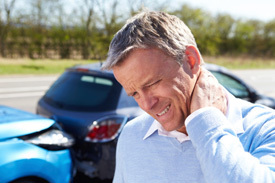 Injuries for auto accidents can also cause headaches, neuropathies, and muscle pain and stiffness. At Goyke Health Center, we offer premier chiropractic care for auto injuries. Spinal manipulation and gentle chiropractic adjustments can align your spine and help prevent chronic problems such as whiplash associated disorders that can, if left untreated, lead to decreased neck mobility and constant pain and stiffness. We will provide you with a full treatment plan for your auto injuries that includes mobilization, massage, rehabilitation exercises and nutritional support. Contact Goyke Health Center in Geneva, IL at (630) 715-1183 to learn more about our treatments for auto accident-related issues. If you’re a new patient, take advantage of a FREE exam and consultation!